[V. We adore you, o Christ, and we bless you. Then Pilate, having scourged Jesus, delivered him to be crucified. Then the soldiers of the governor took Jesus into the praetorium, and they gathered the whole battalion before him. And they stripped him and put a scarlet robe upon him, and plaiting a crown of thorns they put it on his head, and put a reed in his right hand. And kneeling before him they mocked him, saying, “Hail, King of the Jews!” And they spat upon him, and took the reed and struck him on the head. Inhumanity reaches new heights. 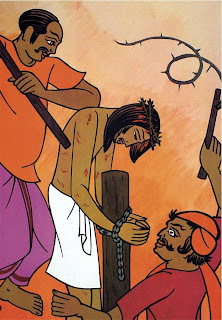 Jesus is scourged and crowned with thorns. History is full of hatred and wars. Even today we witness acts of violence beyond belief: murder, violence to women and children, kidnapping, extortion, ethnic conflict, urban violence, physical and mental torture, violations of human rights. Jesus continues to suffer when believers are persecuted, when justice is distorted in court, corruption gets rooted, unjust structures grind the poor, minorities are suppressed, refugees and migrants are ill-treated. Jesus’ garments are pulled away when the human person is put to shame on the screen, when women are compelled to humiliate themselves, when slum children go round the streets picking up crumbs. Who are the guilty? Let us not point a finger at others, for we ourselves may have contributed a share to these forms of inhumanity. Most of all, may we share with the indigent your “word” of hope, your assurance of care. May “zeal for your house” burn in us like a fire. Help us to bring the sunshine of your joy into the lives of those who are trudging the path of despair.